TRUE CULTIVAR COUNT™ is a trademark of the New Ornamentals Society (www.cultivar.org). 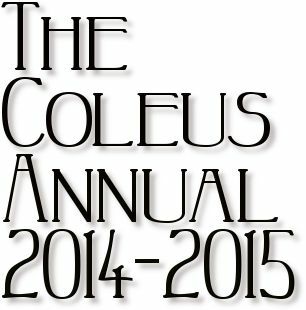 Membership starts at just $36 a year and includes the largest cultivar encyclopedia in PDF and THE COLEUS ANNUAL which you own and may keep forever. Members receive the full cultivar encyclopedia, now with more than 1500 different cultivars. It now covers over 419 large PDF pages, about 600-700 pages of content in a printed, wide-margined book. 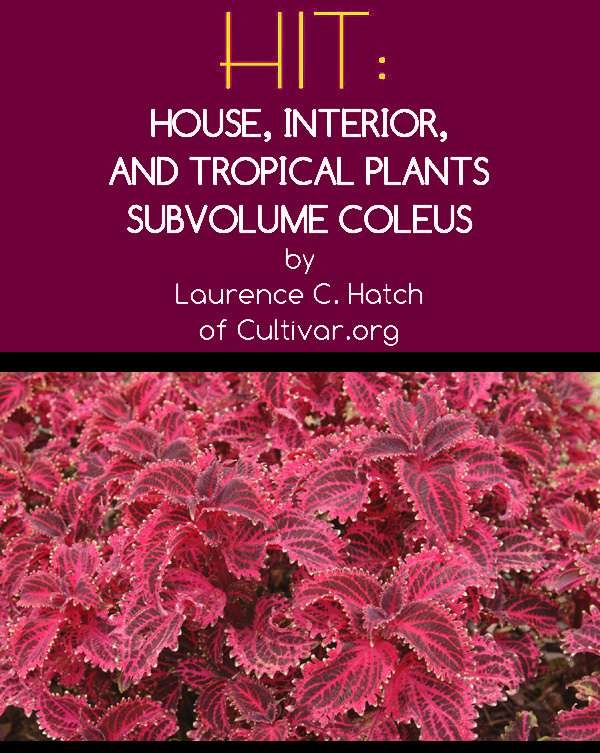 Unlike some popular books, this massive guide includes taxonomic quality descriptions (no "pretty red and gold" stuff), high-res digitial scans, detailed history, and plates from classic old catalogs and articles about Coleus. We are literally writing "the book" on Coleus and our members share in the duty to keep it complete and accurate. Click here for a 12 megabyte, 31-page sample of this detailed encyclopedia covering named clones from 1856 to present. A wonderful gallery of paintings, digital images, and other media focusing on the beauty of Coleus. These works range from famous artists to very recent, modern pieces. COLEUS ID GRID: a spreadsheet with Cultivar Groups as rows and Color Groups (ie. green centered red, yellow mottled red, chartreuse veined purple), showing names of cultivars in each combination of the traits. There are current 504 cells or ID Groups to describe the diversity in this vast genus. ICS Cultivar Polychotomous Key: This is a modern version of the traditional taxonomic identification key where you have two choices but in this case 2-5 answers to each question. Our goal is to present the 200 most popular cultivars in groups similar to the ID grid but in this classic form - like a decision tree. We eventually hope to harmonize the two tools but for now each serves a slightly different purpose. ICS TRIAL REPORTS: each year we produce a PDF trial report with very high resolution, digital JPG images (most 1200-1250 pixels wide) with scans of cultivars we have evaluated in our trial gardens. With 78 cultivars in 2014 and over 114 in 2015, this set of amazing, best-ever in the genusimages provides a wonderful set of tools for identification. Sometimes we compare and contrast similar clones on one scan and other times it's just one cultivar with ID tips on how it differs from the hundreds of cultivars we've already studied. Best of all, the trial report is a rapidly-changing document you DO NOT HAVE TO WAIT FOR! 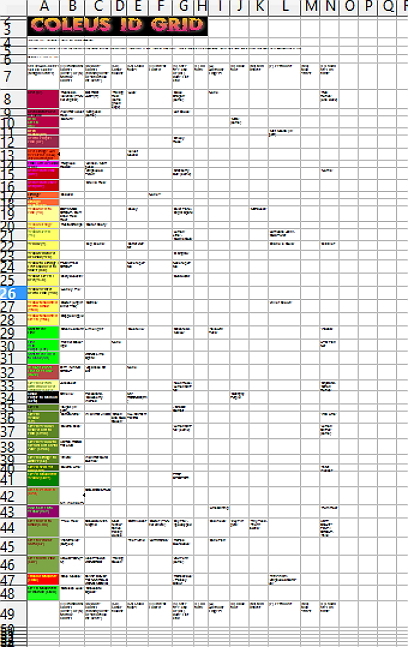 We update the report every 2-4 weeks during the active season (and yes, we have indoor trials yearround now) so there is always some useful visual data to view and download for your personal reference library. MEMBER-ASSISTED CONSULTATION: we have three members with expertise in identification, taxonomy, and breeding unique traits to help answer your emails as a member when the above tools fail or give unclear results. And when you join, we'd really treasure your expertise as a Coleus expert or casual observer. Ability to serve on our special committees devoted to such topics as show standards, design, genetics and breeding, taxonomy and nomenclature, marketing, and general administratrion. are supported by member's dues and donations. In 2014 we had 98 cultivars and clones on trial in and 2015 we topped out at 151. The detailed Trial Reports show photographs and detailed leaf scans of this material. It all makes for an advanced study guide to the best heirloom and modern cultivars, how they differ (or not) and also something a useful buyer's guide for our own plant purchases. The following image is typical of our trial reports and includes a highly accurate metal cm ruler and color calibration tab. Most of our scans are corrected realtime in a simple but accurate way - we simply hold the same fresh leaf, just scanned, up to the screen in Photoshop or GIMP and adjust the colors if needed. is a fancy term for measuring everything about a cultivar to find ways to both identify and separate (delimit) the variable morphology and colors of this genus. Sometimes two cultivars which look very similar to the casual observer can be told apart by counting the number of teeth or measuring their unique. You don't know until you try. We have and the results are fascinating. As a member, you can measure your plants and contribute to this worldwide project to understand the genus even better. is the next logical step from phyllometrics or measuring leaves. We take those numbers and use statistical tools to group cultivars by similar groups of traits. Thus if we have an unknown plant we can try to match it up to all known material in the database. Data and plant sharing among members. It is our goal to curate and manage a worldwide, distributed collection of rare and heirloom cultivars among our members and supporters. Trading clones among members and listng them for trade is our first step. Of the 1500 known Coleus cultivars, probably less than 500 still exist. Some people subscribe to the Darwinist-Capitalism theory when applied to hortiuclture; meaning all good cultivars will find a way to survive, find a market and live on. Sadly in the world of humans where plants are almost randomly conserved and perserved for the next generation, we have lost a large number of unique clones and valuable germplasm. We hope to minimize the harm to Coleus diversity in the future but sharing more widely with an international system of backing up, you will, or replicating rare stock around the world. Even now in 2015, some cultivars are so rare that just one or two growers handle all the distributution for the world. 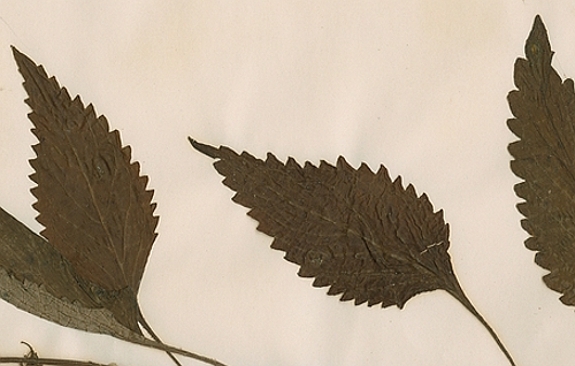 is just one of several projects the ICS has to preserve historical docucments about Coleus. These include nursery catalogs, old articles, images (print or scanned), and rare books. We even catalogs from 2000 to present because they tend to disappear from the internet, never get printed in hardcopy form, and more than 12 major Coleus growers have simply gone out of business! INCA has copies of more than 38,000 nursery catalog pages from 2000 including some amazing growers that sadly no longer exist. For example, the 1897 Burpee Farm Annual with this first ever picture of the Laciniate-Fimbriate leaf morphology known in North America is shown below with the earliest known image of 'Salicifolius' from the Germany originator. 1. 1100-1250 pixel wide, high-res digital, screen-filling, sometimes stunning Coleus images which are staples of the New Ornamentals Society program since 1993. When we don't have our own we get permssion from the big houses to promote their cultivars with stellar JPGs. 2. Expert taxonomic evaluation of nomenclature and construction of detailed cultivar descriptions. 3. Historical context and integration of new and old cultivar taxonomy going back to the 1840's and before. Not one Coleus book does this right. 4. Exploration of genus and species nomenclature including the brain-dead Solenostemon single species myth for all hybrids and an honest appraisal of other genus choices. 5. No more "pooled ignorance" and awful, tiny blurred images from popular garden blogs and pseudo-authoritative databases which post anything, everything, and have no means or desire to filter out fact from fiction nor good science from bad science. 6. Links to sources for new and rare cultivars. Intellectual "know" is not enough in a crazy, complex, and phenotypically wild genus like Coleus. We need to read, know, and grow. All three. Grow everything you can afford or have space for. It's the only way and in that process we will adore Coleus more. To some they are trash annuals; mere colorful toys or bobbles, garish or gaudy things with flecks and stripes, hard to delimit and mostly not worthy of close inspection. Not so! Today the best clones are far above most perennials and trees for sophisticated chimeras, pigments patterned by unseen artists, and heavenly morphology. Where else can a buck's worth of seed produce so much entertaining and shade-banishing color? No Hosta or Cornus can pretend to be so complex. Are Coleus poor cousins to enduring perennials and massive trees likely to overlive our grandchildren? In no way since 1890 perhaps. Be not discouraged for Coleus are an ancient genus of pride from ancient lands to the most demanding folks in Victorian England to the finest gardens ever constructed on this earth in a hundred fine countries this very year. They are mints with a glint and when human intellect joins their ready genetics - watch out for very lovely things to acquire, treasure, and share. Coleus are real gems, beacons of horticultural refinement, and not pretenders to class or new form. Any fool can make a nice Coleus garden for $50 to $200 mailorder. And for that reason the uber-design and mega-Hosta and elite-orchid snobs will never want to be among us. Barriers are down and rewards are high in this genus - like it or not. Coleus are a people's flag, a shining reminder of a simpler time when 500 seeds a' ready and slips from your grandma got you a garden prettier than most anything you'd ever seen - and we can still make as many as we care to share with friends and family. Heck they even root in water and do colorful hydroponic dances for years. Even the most pricey Coleus this year is just six whole dollars. 7. Youtube, Google Books, blog, catalog, and other types of links of merit. Good solid resources with no junk. 8. A new Coleus Cultivar Registration Project outside the ISHS-ICRA system we will launch online in 2014. HITS from the Cultivar.org is identical to the full member's ICS CULTIVAR FILES for the genus Coleus. HITS contains all genera or groups of indoor and tropical plants. HITS is updated during the subscriber's 120 day download interval while ICS members receive all the updates 365 days a year. This society is a spin-off of the HITS project and GENUS CENTRAL of Cultivar.org due to high, worldwide interest in the genus Coleus. The Coleus Finder by Addink (website, cultivar checklist, source finder) - a vast resource to 1433 different cultivars with links to more than 1115 photos, sources from 44 suppliers. Apparently not updated since 2008 but it remains a potent, transformative reference. 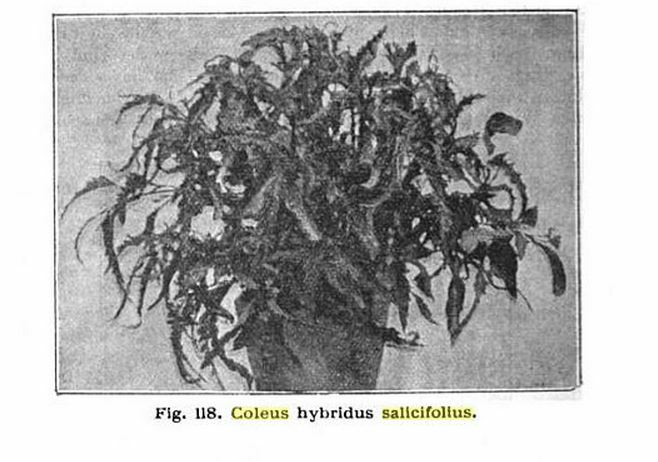 The Establishment of Varieties in Coleus by Stout (ebook, Google Books) - pioneering scientific study of coleus clones, their markings, and inheritance. This classic is free courtesy of Google Books. Coleus Breeding by Dr. Bob Bors, Plant Science Department, University of Saskatchewan - best known for the breakthrough UNDER THE SEA® series. The discussion of cultivar groups in any genus, especially with the lack of a plant society or registrar for a century and half, is sure to be loaded with controversy and disagreement. To create the online form for our new International Coleus Register, we had to quickly decide on a set of group names, giving some synonyms, and make this clearer with the use of an illustration. 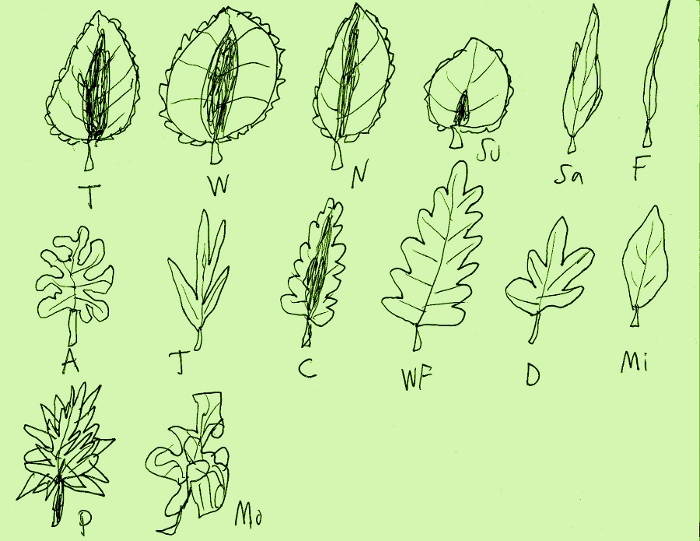 Based on leaf morphology (primarily leaf shape) we selected these groups. The illustration below is simple and crude but we hope will due for the time being - until a artist can volunteer to assist us with this. Plates of real leaves will be coming to provide real life examples. Recent updates are marked in red below with the date of the change. (LP) - Lacerate-Pinnatisect (highly incised, torn or lacerated, forming deep, distinct pinnate divisions). Differing from the Lacinate-Fimbriate which is also incised but have much deeper incisions at 50% or more of the distance from the margin to the midrib. This incision is typically 3-20% in Lacinate-Fimbriate. The blade may also appear to be lacerate or torn due to the extreme incisions and numerous divisions to tertiary and quarternary levels. 'Black Lace' and the old 'Pectinatus' typify this gorup. The margins may be bilobate, trilobate, or forked like (L). New group accepted 8.22.2015. Let's discuss some of the rationale for these choices and we then invite you to comment and make a case for other names. After the bigeneric hybrid, the first three groups are based on the classic Blumei coleus in it's traditional ovate shape and both narrow and wider variants of it. By the way, these can be fimbriated or lacinated (cut, incised) to various degrees or just crenate or serrate. Then the very round Suborbicular, most of which belong to C. rehneltianus - but not all! The saber or willow types are next and the oldest name in literature for these is Salicifolius. Filiform are very narrow, thready things. The deeply lobed types include those with bulbous or turbinate or anemone-like lobes. These have rounded lobes and the name Anemone-Fingered seemed right. The Pedley's use of the term Fantasia covers these but from their illustrations definately includes other leaf shapes including what we call Monstrose and Petticoat. Those with deep, pointed lobes, sharp and forward-projecting are called Trident-Forked. The oldest name for oak-leaved cultivars is Quercifolius but we do not good illustrations, plants, or images of what that old term meant. Claude Hope's breaththrough Carefree strain has spawned many similar clones of improved shapes and colors. These narrow, often grooved, rugose (rough, textured), and undulate oaks are called Carefree-Oak. The wider, less rough, flatter oaks are called Wide Flat Oak are probably whatr we called Quercifolius a hundred years or so ago. Duckfoots are short, reduced leaves with very few lobes compared to Anemone-Fingered but these two groups so overlap. Minimalist, for lack of a better term, includes unlobes simple blades in the ovate, obovate, toe-shaped, and even spoon-like shapes - a diversity of tiny blades that are often very variable. Petticoat seems to be an accepted term in the trade for skirt-like, twirled, or spiralled blades of which 'Tilt-a-whirl' is a perhaps example. Monstrose includes blades so variable, deformed, often blistered, rumpled, and misshapen they can be beautiful. They too have intermediates to the Carefree-Oak and Anemone-Fingered groups. This section will feature more technical, scientific, and academic resources involving Coleus genetics, breeding, and cytotaxonomy. Nguyen, Phuong Ngoc. 2007. Genetics, breeding, and molecular study of Coleus during growth and development. Ph.D. dissertation. University of Florida. Rife, David C. 1944. The genetics of certain common variations in Coleus. Ohio Journal of Science 44(1): 18-24. Rife, David C. 1971. Leaf shape inheritance in Coleus. Quarterly Journal of the Florida Academy of Sciences 34: 187-190. Rife, David C. 1954. The purple allelic series in Coleus. J. Genetics 54(2). Nguyen, P. et. al. 2008. Genetics of growth habit and development of new Coleus varieties with trailing habit and bright color. J. Hered. 99(6): 572-580. 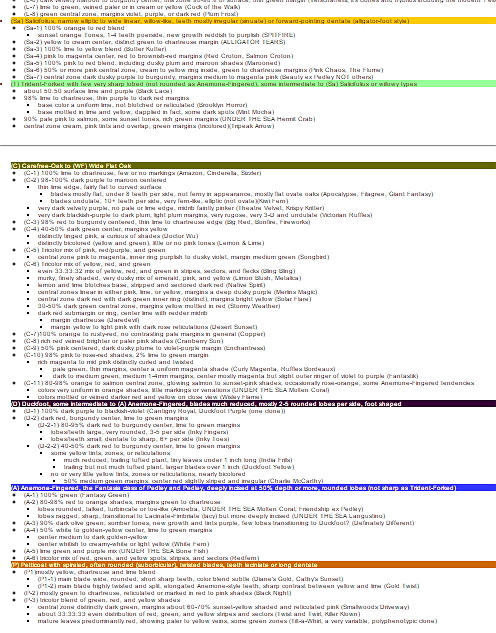 In preparing the International Coleus Registration Form, we decided to follow some other societies in providing our own color chart to help standardize colors a bit or at least improve communication. Some people's purple is another man's lavender or another lady's violet. Those are very distinct colors when you study them using true color expert's material. Is plum the same as purple? Plums, the fruit, can be true purple. Traditionally however a plum-colored thing is violet-red or reddish-purple, not dark purple nor like grape soda either. Is lime the same as chartreuse? Not according to color experts who make a living in that field. Our simple chart follows. The industry standard in horticulture for years has been the Royal Horticultural Society's or RHS Colour Chart. Unfortunately it does not have enough colors for many genera and when it can be found in the larger, famous green-boxed edition it's usually US $150-275. 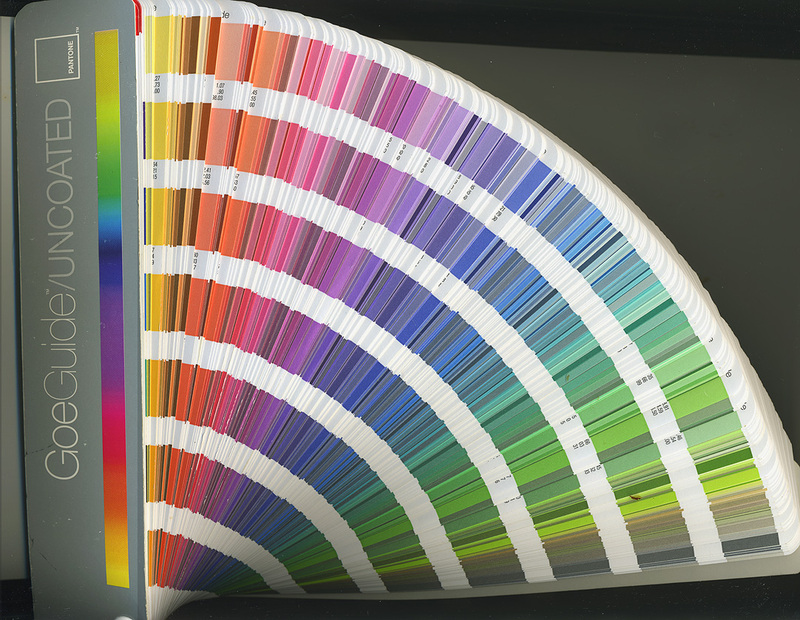 At the New Ornamentals Society we use the Pantone Goe system with 2058 different colors and that can be had online (especially ebay) for $70-110. Today we find more than 200 US Plant Patents using the Pantone Goe system instead of the RHS because of it's greater range of colors and portability as one large fan. Five minutes with the Pantone Goe fan in a diverse garden (we sampled the 6000 taxa at the Raulston Arboretum and the 11,000 at Juniper Level Botanic Garden of Plant Delights Nursery) and one realizes why this color system is the international standard among graphic artists, designers, manufacturing planners, architects, marketing consultants, printers, and pretty much every other industry on earth. There's a darn good chance your favorite sports teams have their colors legally defined in Pantone PMS values with everything from uniforms to stadium seats specified in these Pantone chart values. The species of Coleus are named many different things and separated variously according to how general or specific the author wants each species to look. We like the Flora of China key very much and this is a helpful place to start for the eight taxon seen there. The biggest question we need to address besides the basic nomenclature is WHAT WAS COLEUS BLUMEI ANYWAY? Firstly, we may never know. I have studied old specimens in virtual herbarium around the world but none of course preserve colors let along pigment patterns. The leaf shapes we do know are quite variable as are the marginal teeth - not as many crenate examples as found in classic Rainbow types today. One place to start is with old, botanical illustrations in journals know for limited artistic license, precise morphology, and accurate colorizing. Yes, they did paint the old volumes by hand back then. Curtis Botanical Magazine Volume 79 of 1853 is about as accurate an example as we can get. The plant came from Mr. Clapton of Low's Nursery, England by way of Belgium and originally from Java. Was this thing a garden plant and heavily modified or selected? We cannot be sure but early cultivars mostly did have the dark red center and lime edges as the plate below shows. In other images of the time and the next few decades, suggest the first introduced C. blumei had this same red and green bicolored look. Some had a smaller red suffusion or smudge in the center and others had finer reticulations or burgundy where the red and green met. Those with big, uniform red hearts were of course preferred in the trade and made up the early breeding stock at RHS Chiswick and with William Bull. The famous early clone 'Verschaffeltii' is merely a very undulate, more fimbriated genetic spin on this same red-hearted, lime-margined theme.These were typical of early introductions to Europe but not necessarily typical of wild variations in the 19th century. Another logical question is WHY DO OLD COLEUS BLUMEI HAVE SHARP TEETH? The "base" cultivars we have today, notably the so-called Rainbow Strain do not seem to be typical of the early introductions of the species. The plate above is a very dramatic acuminate (sharp apex) blade with massive serrate teeth, hardly the round, tiny crenated teeth of so-called base or standard material today. From studying old herbarium vouchers and many old illustrations, I believe you have both serrate (sharper teeth) and crenate (softer, rounded teeth) in wild populations and different parts of the range, let along local gardens, favor one morphology over the other. Let's look at this fascinating sample of a herbarium voucher at the New York Botanical Garden. It was said to be Coleus blumei var. laciniatus Miquel. It was collected by the Wilkes Expedition in the Philippines between 1838 and 1842. It is thought to be the type or oldest designated specimen for var. laciniatus Miq. - which may or may not be similar to the garden var. laciniatus of the early trade. Now this is a departure from the typical C. blumei we have today! It is sharply and jaggedly toothed and with a much narrower blade. Since then botanists tended to lump var. laciniatus with the species as part of it's normal range of variation. In horticulture we see much more importance to this local morphology. Let's begin with the major university trials that work often with Coleus. Not all trials including AAS Trial Gardens grow enough Coleus to be useful. ICS Trial reports are available from our member's website and appear in The Coleus Annual the following year. Exotica 3: Pictorial Cyclopedia of Exotic Plants by A.B. Graf (book, Amazon) - this massive, thick tome covers more tropical and indoor plants than any printed book today and is loaded with Coleus plates (mostly black and white) and helpful history and descriptions. It is no longer just for libraries with the former $200-300 pricetag and can be bought for $35-50 most of the time. Check ebay too for low priced used copies. Coleus: A Guide to Cultivation and Identification by Ken and Roy Pedley (book,Amazon) - the 1974 classic loads with history, leaf shape illustrations, photos, and enormous amounts of cultural advice on everything from greenhouse product to making Coleus trees. Coleus: Rainbow Foliage for Containers and Gardens by Ray Rogers (book, Amazon) - very useful modern study with lots of color plates and good descriptions to 225 cultivars. This section covers some useful terms to describe the world that is Coleus, primarily those of a precise, scientific nature. Bilobate (adj.) - having marginal leaf lobes that are 2-lobed, forked, split, or otherwise forming two distinct lobes or sublobes, usually in Coleus these are bulbous lobes with 1 smaller branch as occurs in the popular Lacinate-Fimbriate and UNDER THE SEA cultivars. Trilobate refers to a single tooth with 3 divisions. Reticulated (adj.) - said of an object with a fine, net-like pattern, usually showy, often with interlacing, crossed lines, web-like appearance or tracery, and in the case of plant with a surface or part marked in such contrasting pigments or colors. Python reticulatus, the reticulated python is well-known, beautifully marked, much prized snake. The Somali giraffe is known as Giraffa camelopardalis reticulata because of it's very ornate, unique patterns of skin colors. Generally all plants have reticulations of veins on their leaves and even in their flowering parts. In Coleus, reticulated clones are those with sharply contrasting veins such as the purple on chartreuse of 'Fishnet Stockings' or the yellow on lime of 'Electric Lime' . The new Terra Nova Coleus from 2014 onward emphasis red reticulations. Reticulations should be described in terms of the vein color, the background or base color, as well as the % of total surface they cover and their complexity. Complexity may follow secondary, tertriary, or quarternary veins or be fairly simple with only some secondary veins in contrasting pale or dark colors. Rubescent (adj.) - literally "becoming red", said of plants with greenish or pale new growth that matures to high anthocyanin (red pigment) levels, showing red to orange tones as these leaves age. For genetic reasons, the red pigment production is turned off or disabled in young leaves. We know in many plants including Coleus, sometimes these red pigments are more intense in the new growth, fading later to green. Rubescent plants are the opposite in green becoming red NOT red becoming more green. In Coleus the new growth is apt to be green, lime, or chartreuse and slowing getting fluished red or orange, some dappled in the process. 'Alabama Sunset' is a classic example of a rubescent clone. Bullate (adj.) - having rough puckered or bubble-like sections such as on a leaf, making small convex cups between the veins, the upper side tall, dome-like, and the underside cupped. Many of the odd Coleus have this rumpled, puckering between the secondary and even tertiary veins. It is a type of rugosity or rough texturing which in Coleus is also accomplished by raised or sunken veins, with or without true bullate aspects. Polyphenotypic (adj.) - having more than one appearance, color, aspect, or form among individual plant specimens having the same genetics (genotype). In everyday terms this means having lots of looks, different appearances, under one plant name that it same clone. This refers mostly to Coleus cultivars which are highly variable in their traits depending on the plant age, light, water, fertilization, soil media, pot size, and other enviromental conditions. DNA is the same but it's expression varies widely with the growing conditions. 'Sedona' and 'Alabama Sunset' are quite polyphenotypic while 'Palisandra' and 'Wasabi' are less so. Variegated (adj.) - said of a plant with vegetative (leaf, stem, bract, or other non-flowering) portions which has zones or regions (usually chimeras) lacking chlorophyll such as white, yellow, or pinkish stripes, sectors, spots, venation, margins, or centers. Many Coleus are in fact not variegated as widely reported in popular media or ignorant garden blogs. Coleus are very definately Multicolored (many-colored) such as Bicolored (2 colors), Tricolored (3 colors), or Quadricolored (4 colors) in most examples but only those clones with tissues lacking green chlorophyll are truly variegated in the correct, scientific use of the term. As Coleus often have chimeras which do not lack chlorophyll and brightly-tinted ones that do, it is often a very subtle, anatomical difference between variegated and non-variegated cultivars; often a matter for microscopic study as some yellow-edged or white-veined clones do not lack chlorophyll in those portions. A cultivar or clone with mainly one pigmentation, not multicolored nor variegated, such as all chartreuse, all red, or all purple forms are to best termed Unicolored. Polyclonal Cultivar (adj.) - said of a horticultural variety of cultivar which is represented by two or more distinct clones (not seedlings or seed forms), usually one of them true and original and the other(s) as Imposter Clone(s). A cultivar which is almost universally regarded, studied, and sold as a single clone (given the occasional mislabeling), is called a Monoclonal Cultivar. The purpose of cultivar registration requires clarification and is not often explained. Firstly, it fosters international communication or development of a community informed about the names in a given genus. This prevents (or at least limits) the occurance of clones given the same name as well as the creation of imposter or misnamed nursery stock. Did someone else alreadsy use my proposed name of 'Golden Magic' or 'Scarlet Delight'? Coleus books and general websites will not inform us with any degree of confidence. Sadly, Coleus Finder, once our Bible for names, has not been updated since 2008 and much has occured since that year. Secondly, registation with a central portal lets us all know about the state-of-the-genus or what other collectors, breeders, and experts are doing and what progress they have made. Whbat are the new breakthroughs in leaf shape, color, landscape durability, flowering, and other valued traits. COLEUS CENTRAL™ already has more than 800 hours of research from the editor and New Ornamentals Society volunteers. Our budget is limited but a low four digits has been spent to get to our 2014 position - with lots more coming to this page. Most of you, we suspect, cannot take that much time so cultivar registers represent a resource it would be hard for nearly all of us to create at home. However, any great registration project is going to need people who breed, grow, and collect Coleus to inform our shared community whether registering anything or not. Thirdly we must state that while registation "establishes" a name in the international trade, it provide no legal protection of the name as does a plant patent, plant breeders rights license, or registered trademark. This process is one of international communication, documentation for future Coleus scholars and breeders, and education of horticulture students for generations to come. There is no Coleus registrar or International Cultivar Registration Authority (ICRA) under the worldwide system managed by the International Society for Horticultural Science. While the New Ornamentals Society is not currently seeking sanction or grant of authority under the ICRA program, we have suffcient internal resources and expertise to take on a Coleus Register using the same principles of the ICNCP or International Code of Nomenclature for Cultivated Plants. Mr. Hatch, Director of the NOS and Horticultural Taxonomist for this project, co-authored the directory of cultivar checklists that appears in the Appendix of the 1995 ICNCP and is very experienced in documentating cultivars that many ICRA consult in the form of the New Ornamentals Reference Library. We thank our partners through the truly stunning web service 123contactforms.com for helping us create a flexible, very versatile registration form that accepts image and file uploads, Google Maps of your nursery or trial garden, and submission of data that exports to a true database and analytical (statistics, metrics) console. Must have the permission of any living person , especially if a well-known person, politician, or celebrity. As stated above, if you want to use an unregistered trademark for your new cultivar, it does not have the above restrictions in general. However, companies will sue in a second if you put their trademarked name on a commercial plant. When using a trademark it is not a bad idea to name a cultivar name with it such as ROCKY MOUNTAIN RED™ 'Rockred1'. Your local university with a horticulture, botany, or agriculture department should have an expert, usually a horticulturist specializing in ornamental plants or a plant taxonomist who can assist you in preparing the information. They can work with us at ornamentals@lycos.com at any time. Also consider a local nursery, botanical garden, or arboretum for skilled professionals. Some of these experts may be interested in promoting your discovery - and may want to provide scientific documentation (herbarium voucher, photos, garden trials), and assist with marketing the new Coleus from their nursery or garden. Just ask. We offer a higher level of assistance to ICS members. Our society experts will complete 100% of the form for you if only if....you do all of these steps (no exceptions) 1) provide a digital JPG image of the mature new cultivar, 2) send a living plant to the NOS/ICS Trials and allow us to evaluate it, and 3) tell us the complete history of the cultivar's origin, your plan's for introducing and marketing it, and any patent or trademark goals. Copyright 2013, 2014, 2015. Laurence C. Hatch. All Rights Reserved. Please direct all comments, corrections, and clarifications to ornamentals@lycos.com and include COLEUS CENTRAL(TM) in the subject line. Hatch, Laurence C. [year accessed]. COLEUS CENTRAL™ of CULTIVAR.ORG [or www.coleussociety.com]. New Ornamentals Society, Raleigh, North Carolina. Note: (TM) may be subsituted for the superscript ™ if the format does not support that annotation. I will not fault some authors and growers from going with the newest, trendy name of Solenostemon for Garden Coleus; but I wonder one thing? Why don't they accept the rest of new taxonomy associated with the mints that makes about as effective a case? Why go with one rename and not the forty others which affect our garden plants? I think it stems (at least in part) from the "one up" game that so many horticultural pseudo-gurus play among themselves and the general design and gardening public. "Haven't you heard? That's the old name...the correct name (which makes me better than you)...is XYZ." How silly and petty for all these early adopters of the preliminary and oft shallow work of overly ambitious taxonomists; who try to "one up" their colleagues for similar reasons. Ask one of these early adopters of radical nomenclatural systems the scientific basis for these changes and they'll fumble about for five minutes or quickly find a reason to change the subject. Don't try to "one up" us folks unless you know why and can be very, very convincing. Solenostemon scutellarioides is not even a synonym of Coleus blumei on which our garden taxa are based. Solenostemon blumei is still a valid name if one wants to change genera. Solenostemon scutellarioides as a name dates from only 1975 - did all those hundreds of earlier botanists, the world's greatest botanists ever in fact, really get this widely grown and studied species so wrong? Very doubtful. Kew Botanists in the their World Checklist say the species belong to Plectranthus with this as the accepted name: Plectranthus scutellarioides (L.) R.Br., Prodr. : 506 (1810). There is just as much as case for this group of plants being part of Plectranthus as Solenostemmon. In fact a number of leading mint taxonomists reject Solenostemon as being useful for most anything. Some want modern Plectranthus and Coleus merged while others split the traditional groups in other ways. I suspect in a few decades all of these gardens items (Coleus to Swedish Ivy) will be mere subgenera under Plectranthus. Our garden Coleus have long been considered Coleus x hybridus, noting their parentage from several species. Even if one accepts Solenostemon as the correct genus, the garden coleus would come from several of the species and not simply from S. scutellarioides or S. blumei. We know that the trailing species Coleus rehneltianus is a parent of the low, trailing, smaller-leaved cultivars and that species remains with Coleus and has no Solenstemon transfer! 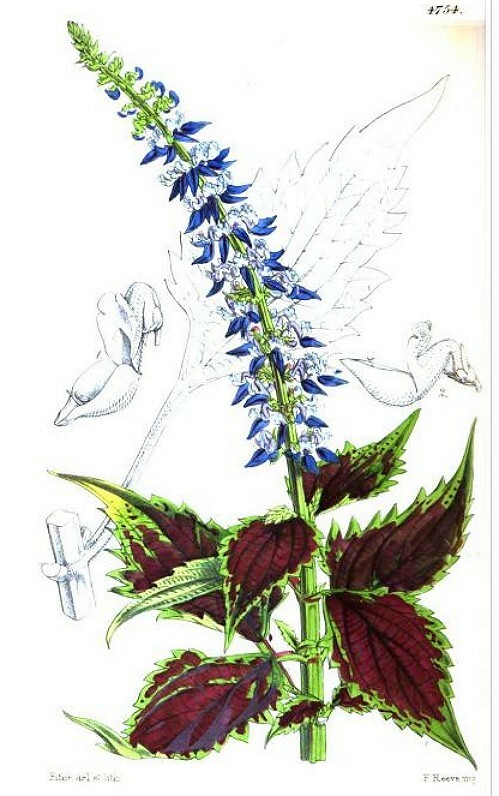 If one agrees to Solenostemon for a second....this means our modern Coleus are perhaps then crosses of S. scutellarioides, S. blumei, and Coleus rehneltianus - thus a possible bigeneric product! All this diversity under one species name? I think not! There is no way to keep all this material under ones species in any genus. Logo use: for the sole purpose of linking to and promoting this site and the ICS from your website or other documents, you may use and include these JPG logos if unmodified in any manner. Please do not use any of the logos above this section without written permission.